Mastectomies have appeared to take on a life of their own in recent years, bringing "new life" into a movement that inspires fear for women at the first sign of breast cancer. However, how much do women understand about the other, less-invasive options available to them? Radiation oncologist, Dr. Benjamin Smith recently presented his findings on the topic at the 2015 San Antonio Breast Cancer Symposium. He and his team analyzed data from insurance claims of 105,211 women spanning a 10-year period from 2000 to 2011. Specifically, the researchers were interested in comparing the complications, costs, rate of recurrence and survival amongst five widely-accepted options for the treatment of early breast cancer. Results from the study indicated that mastectomy with reconstruction was more costly, and resulted in more complications (almost twice the risk), as compared to lumpectomy with whole breast irradiation. Interestingly, the rate of cancer recurrence and survival were comparable with both therapies. We here at the American Council are not sure what the big revelation is. This has been long proven that breast conserving surgery (lumpectomy plus irradiation) is equally as effective as a total mastectomy in almost all situations, and produces similar outcomes. 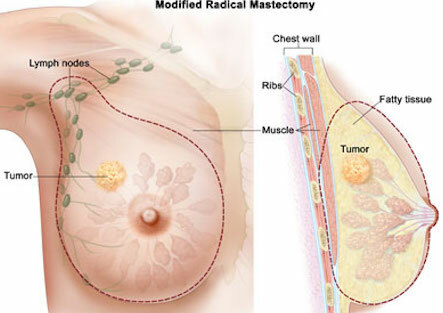 The real question is; Why are mastectomy rates rising so dramatically? A 2014 study published in JAMA Surgery cited a 34 percent increase in the rate of mastectomy in the U.S. from 1998 to 2011. It is postulated that fear is the driving factor behind the rise. Add to that the publicized stories of celebrities like actress Angelina Jolie and Food Network hostess Sandra Lee who've related their personal decisions to have prophylactic mastectomies and the situation worsens. It should be noted that unlike Ms. Jolie, the vast majority of women do not have the BRCA mutations, which increases the risk of developing breast cancer by 30-80 percent. So why choose mastectomy over lumpectomy and irradiation? Complications like infection, hemorrhage and bruising are more likely with a mastectomy. One has to wonder if surgeons are doing their jobs. Not just the cutting part, but the part where you sit the patient down and explain to her their options all five of them if you happen to have early-stage breast cancer and then detail the risks and benefits associated with each. Education is the key to getting a handle on this situation. Another important study (actually, two) appeared recently in JAMA Oncology. One, entitled "Time to Surgery and Breast Cancer Survival in the United States," was done by a group based at the Fox Chase Cancer Center in Philadelphia. It's goal was to study the effect of the relationship between the time elapsed between diagnosis of breast cancer and surgery, on the one hand, and survival on the other. This study's populations were two large databases (SEER, 94,544; and NCDB, 115,790) amounting to about 200,000 women over age 66 (one cohort) and those over 18 (in the second) with stage I or II invasive breast cancer. The researchers found that mortality from breast cancer increased by 26 percent for each 60-day delay in the SEER group, and by 10 percent for each 30-day delay in the NCDB cohort. The second study, "Delayed Initiation of Adjuvant Chemotherapy Among Patients With Breast Cancer," studied how the interval between surgery for breast cancer and the initiation of chemotherapy related to survival. This group, from the University of Texas-MD Anderson Cancer Center in Houston, used data from the California Cancer Registry obtained from the records of almost 25,000 women (mean age 53) with stage I, II or III invasive breast cancer. Average time to chemo was 46 days. They found that there was no significant effect of delay in starting chemo up until 90 days post-op. Women experiencing a greater delay than that, however, had about a 30 percent increased risk of mortality. An editorial in the same journal delivers the take-home message in its title: "Timeliness in Breast Cancer Treatment The Sooner, the Better." Written by cancer experts from the Dana-Farber Cancer Institute/Brigham and Women s Cancer Center, Boston, that is the bottom line of these studies. Why wait?